Following on from Quaeritur: When Were the Angels Created (Part 1) and Denys, Thomas Gallus and Angels (Part 2), the task I set myself has proved rather difficult. The challenge was to create a visible and symbolic representation of the ninefold quire of angels. The idea was not to present the hierarchical order as tutelary deities of classes and groups of visible creatures, but rather to find a visible order that would give expression to their spiritual and celestial activity. The symbols need to follow the function of each hierarchy as set out in Part 2, but also to be in keeping with the canonical and inspired symbolism of the angelic orders, and the traditional imagery associated with them, as given in this table below. When I first thought of matching up this hierarchy to the visible creation, the obvious place to turn to is Genesis 1. It is a commonplace that the first three days of creation correspond with days four to six: oh, I thought, then let's subdivide days four to six into two to make a three by three table for the three angelic triads above, and see how the two tables overlay each other. Here is the resulting ninefold creation table. For reasons that I will come to, some seemed to fit reasonably well (e.g. (1) Seraphim = Light) but others not so well (e.g. (8) Archangels = Sea Creatures). So I had to think again about my sub-divisions, and then I finally realised that good old Charles Williams of Inklings fame had the key. For Charles Williams in that wonderful supernatural thriller The Place of the Lion, the animals are the visible form of the Virtues. And this makes perfect sense as the Virtues are the middlemost of the nine orders of angels, for the virile and courageous virtues or contrariwise his vices are associated with the middle part of man, with the chest; but the virtues (and vices) are also associated with certain animals. Courage is associated with the lion, for example; and one may be greedy as a pig. Look up the Vespers Hymn of the Breviary for Friday, Feria Sexta, and you will find that the wild animals of the Sixth Day of creation are associated with the passions of man, and he is commanded to subdue them under his kingly rule. And what is a passion ordered and trained but a manly virtue? (For a depiction of the feral vices cf. Edmund Spenser's Faerie Queene Book 1, Canto IV in which the Redcross Knight visits the House of Pride. A priceless poem: one shouldn't be put off by the length, it is more worth it than War and Peace, and C.S. Lewis was very right when he said that to read it was to grow in psychological health.) The Virtues should therefore be symbolised by the animal kingdom, but also - as briefly noted above - for the further reason that in being housed in the middle part of man, his chest, they are midway between the contemplative head and the active loins and limbs - and we can see that in our angelic hierarchy the Virtues form the middle order of the middle triad, and mediate courage and purposeful will between the upper contemplative half and the lower active half of the celestial orders. So I simply had to move (6) into the same box as (5), so that the Virtues are now symbolised by the Beasts. This left a vacancy in (6), but that was no big difficulty as (3), representing the Third Day of creation, was overloaded anyway. I simply moved the Seed-Bearing Plants into the vacant box (6). The birds were moved into box (8) along with the fish, to represent the Archangels (my rationale for this is given a bit further on, below). After a further minor adjustment (splitting the heavenly bodies into two classes to make up the symbols for (4) Dominions and (7) Principalities, what we get from this rearrangement is the following table. (1) Seraphim are best symbolised by light, (or perhaps even the darkness before the light was made - as in Henry Vaughan's "there is in God a deep but dazzling darkness"), as they are in closest to God and are fired immediately by Him into life. They are unable to look upon God for awe and cannot themselves gaze upon Him (with two wings they cover their faces), but by the fiery light of glory that God kindles in them the next order, the Cherubim, see. They do not rest from praise (with two wings they cover their feet), like light which is forever emanating from its source. But they are swift (with two wings they fly) and eloquent in proclaiming the Tersanctus, the devastating purity of their Origin. They are not numbered, for they are so much at one with God that their number seems irrelevant: and Light seems an apposite symbol for the unnumbered Seraphim, for its beams are Many, yet it remains at unity with its source. (2) The firmament is filled with light: likewise the Cherubim are enlightened by the divine Light poured through the seraphim, and the Cherubim are therefre best symbolised by the firmament. There is a biblical justification for this identification - the Cherubim, in the Temple, were embroidered upon the Veil which represented the Firmament. With the creation of the firmament, the primal liquid chaos is separated and a place prepared for the world. Thus it is fitting that the number of the Cherubim is four, the number of Creation and the four corners of the earth, and fitting that the faces of the Cherubim are the great Archetypes - Man, Ox, Eagle and Lion - that will enclose all other lesser types. (Note that the cherubim's faces are represented by these Archetypal forms, but they themselves are winged as befitting their symbol, air. What then do these faces mean? If the cherubim are the supra-rational "unknowing" knowledge of love, perhaps they are faces of the love that "moves the sun and the other stars", in its transcendent (aquiline), sacrificial (taurine), powerful (leonine) and upright and kingly (human) qualities.) With the creation of the firmament one does not yet have the creation of distinct visible things - and the firmament is therefore a fitting type of the Cherubim who are the unknowing of love. The firmament represents the medium (Cherubim) that is filled with the light of God (Seraphim) before any discrete knowledge of the divine in created things. The light and heat of the fiery seraphim - which would not otherwise be transmitted to us - is received by the airy cherubim and becomes available to all the rest of creation. (3) The Thrones are symbolised by the utter receptivity of the mineral world, with its complete passivity to the divine Law: the dry land, emerging from the primeval disorder of the waters beneath the Firmament, is the mineral and inorganic creation that remains forever charged with intense and incredible energy. The billions of atoms are the multitudinous eyes of the Thrones, that look back toward their Maker from every infinitesimal point of his creation; the wheels within wheels are their unwearied and inexhaustible power (Ezekiel seems to describe the ophanim quite literally as a dynamo); and they are filled with the spirit of the Cherubim which is love for their Creator, and they follow that love whithersoever it leads in an inviolable obedience to His command. The inorganic creation sets the law for all the rest: and so is a fitting symbol for the Thrones whose obedience to God's rule sets the frame and constraint within which all the lower orders of creation must necessarily act. According to Gallus the Thrones are the ecstasy of the mind filled with God; which fits quite well, I think, with the notion of the dry land rising out of the chaos of the waters below into the firmament and into the light of day. There is a correlation between the ecstasy of the mind (Thrones) tutored in meaning by the fire of grace (Seraphim) and the experience of love (Cherubim), and the mineral creation brought into being out of disordered motion by the reception of the inner radiancy of light (symbolising the Serpahim) in the field of energy (symbolised by the Cherubim). Interlude: We now have the four elements of the world, which further special creation will elaborate: the primal matter of heaven and earth (Water) over which the Spirit hovered in the beginning, Fire (Seraphim), Air (Cherubim) and Earth (Thrones). (4) The stars I have taken as symbols of the Dominions, who rule the nations and all the lower orders of angels with benevolence and without coercion. What better symbol than the Twelve Signs, and all the lesser signs seen in the night heavens, to represent such a rule? The stars (Dominions) do not determine our fate or destiny, but benevolently give to us and to our homeland that character that may be moulded by the will. The Dominions receive the inexorable rule of the Thrones, but transform it into something less terrible and more malleable: just as the benign influence of the Zodiacal signs translate the "army of unalterable law" into a blessed heritage of the heavens within our soul. Note also that some alternatives to Dionysius' hierarchical order places the Aeons, the Lords of Time, in place of the Dominions: but the Signs of Heaven have this aspect too, for they rule over the disposition of the Ages of the World also. (5) The central order of the nine, the Virtues, I have already discussed above the preceding table. Suffice to say that they allow the benevolent and unforced rule of the Dominions to be converted into good and firm purpose. Charles Williams identifies about six or seven of his Nine Virtues in The Place of the Lion but leaves one to guess the rest. There was an article on the Internet called "Balancing the Angelicals", that I printed off once but which has since disappeared from the web, and which filled in Williams' blanks convincingly. I now seem to have lost my paper copy also. But from memory, Williams holds that the central Virtue of his nine imagined Virtues is the Eagle, which keeps the others in their proper place, and represents dispassionate appraisal or philosophy; the other eight Virtues come in pairs and balance each other. For example the Lion of Courage is balanced by the Lamb of Innocence, the Unicorn of Swiftness by the Horse of Steadiness, the Ox of Strength by the Butterfly of Beauty, and Serpent of Wisdom by the... but here I can't remember... was it the Lamb that balanced the Serpent and then there was something else to balance the Lion? I need to read the book again and find the misplaced article which is buried somewhere in my mess. Ultimately the role of the Virtues (or the soul schooled and trained by them) is to direct the will upwards, to the free and willing giving of oneself to God - to bring us back to Gallus again. And this is symbolised nicely by the animals, which symbolise the moral schooling of the dispositions given the stars (or Dominions) so that we can enter into the freedom of the nature given to us by God. (6) The harmonious rule of the Powers is represented by organic life, the Seed-Bearing Plants and all things that grow. The principle of organic life orders the inorganic life of the cosmos in a harmony, so that it flourishes, lives, gives fruit and sustains: and in like manner the Powers order all the functions of the cosmos - including the virile purpose of the Virtues - so that they work together for good. And just as what is needed from a rule that is ordered towards harmony is that it remains almost invisible and does not arrogate power to itself, so also the Powers seem to function almost in silence (just like the slow growth of swelling fruit) between the louder and more resplendent Virtues and Principalities. But their nourishing and sustaining role is indispensable, nonetheless. Plants spring up in all kinds of strange places; they are eaten and then grow again from the seed that falls into the ground and dies: an apt image indeed of the work of the Powers, in their gentle rule, for unity and growth comes almost unseen, and springs up again and again despite being ever consumed in destruction and disharmony. Like some other orders of angels, however, some of these are fallen (cf. St. Paul), and use their gift of bringing a false harmony to give an unhealthy and unholy complacency to peoples and orders who lack a balance of the Virtues. As a result of true harmony wrought by the unfallen Powers, however, the desire is turned toward God, strengthened by the manly Virtues. (7) The Principalities, who translate the Powers' harmony into the social order, are typified by the lower heavenly luminaries, the seven lowest spheres in the Ptolemaic astronomical system: the Moon, Mercury, Venus, the Sun, Mars, Jupiter and Saturn. Some of the Principalities at least have fallen (cf. Daniel 10:13 and how the fallen Principality, the Prince of the Kingdom of Persia, withstood Michael the Archangel). Their role is to order the exercise of power: they are the ἀρχαὶ, the archai, the originators of authority among nations, but do not exercise it themselves directly - and the planets seem like a good fit because they are so international and ubiquitous in their influence (think of the names of the days of the week in either the Latin or the Norse versions, and I believe the Sanskrit). They - together, regulated into harmonious working by the harmonious Powers - order the cities of men so that their polity is just and leads their citizen to the polity of the heavenly City. And the planets are a good image of this because their combined working upon the earth produces all the metals for manufacture (silver, mercury, copper, gold, iron, tin, and lead), psychological dispositions and artistic skill (the mercantile, the amorous, the jovial, the poetic and medicinal art of Apollo), for the proper execution, building and rule of a Commonwealth. Oh, I know that someone is going say that the planetary deities are bad because they have been worshipped as gods e.g Zeus in Athens etc., but this idolatry could have occurred for two reasons. (a) Because some at least of the Principalities are fallen, and have fallen down to the Archangelic function (the governance of specific peoples rather than ordering rule as such) from their proper function. Being too eager to exercise their power in their pride, they have seized the rule over peoples and nations (the function of the Archangels: hence the strife between a Prince and the Archangel Michael, who overcomes a natural superior because he is in grace): the fallen Principalities destroy the harmony of the Powers by offering their individual Princely gifts of rule to a people in return for idolatry, who then bring a host of woes upon themselves and their overweening empires. The idea, here, is that some peoples with the aid of Principalities become mighty because of the patronage of a higher spiritual power than their neighbours, but that this is ultimately destructive of their own internal order because it becomes unbalanced. (b) The Principalities themselves are not all fallen, but their image and function is corrupted by fallen angels who seduce peoples to worship them under the guise of heavenly Princes, and who then usurp the spiritual direction of these peoples. In other words the fallen angels win an unholy cultus by imitating the Principalities. The propensity of the Principalities to seduce is due to their association with the faculty of imagination, which properly and harmoniously ordered leads up to God and gives discernment of good and evil (see Dionysius and Gallus on the Principalities again), but it is also the faculty most easily led astray. C.S. Lewis's planetary intelligences in That Hideous Strength have obviously been a source for my ideas for the Principalities, and Lewis is also to blame for the idea that some spiritual forces may be benign - not necessarily fallen - but the knowledge of them is dangerous for us because we may be seduced by their glory. (8) There is quite a lot of information about the Archangels in the table above: they exercise rule over peoples and their affairs - trade and so on - and Michael was supposed to be the special guardian of the people of Israel. They are supposedly seven, and there is quite a bit about them in the Book of Enoch which has canonical status among the rather interesting Ethiopian Orthodox Church. It is quoted in the Epistle of Jude, so one can hardly blame them for that tradition. For our purposes, they crystallise the more general rule of the Principalities to particular peoples - they seem to be associated with particular Principalities directly, as for example Michael who is martial, and Uriel ("light of God") who is said to be associated with the Sun. I have taken their symbol to be the Birds (in the book of Revelation the archangels are depicted as flying in mid-heaven), ruling over the Fish who are the nations (remember that symbolised by the sea and its shoals of fish). Fittingly for the Archangels, birds are associated with augury. For as interpreters of the revelation of God Archangels explain and interpret the messages of God's Angels and lead one to the heavenward guidance of the Principalities (who are, for Gallus, sanctified imagination.) 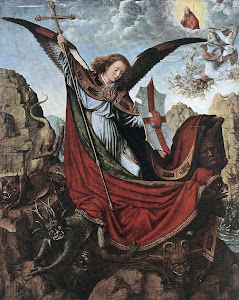 Thus the Archangels are the discernment of the signs given by God (by the hand of Angels) by the intellect stepped in faith, ordered by the holy imagination (Principalities) which synthesises all one's emotions and bodily life into the desire for God. (9) Last of all, the order ruled by the Archangels is the Angels, who bring the messages of God to individuals rather than people. Accordingly, they are myriad, and so are their manifestations. But here they are represented by Man as the form of their most recognisable visitation to us. The Angels bring God's message to us in its most simple, accommodated and human form; the Archangels interpret and point that message upwards to the One from whom it comes, God. Thus the Archangel Gabriel sums up all the Angelic agency and visitation of the Old Testament in the Annunciation, and points the Virgin Mary towards the power of God descending upon her from on High. Man is the next rung on the ladder of creation below the Angels (cf. Psalm 8 "thou madest him a little lower than the angels..."), but also (and mysteriously, due to the Incarnation), Man is also on a rung above the very seraphim ("...to crown him with glory and worship"). Thus, when we reach the bottom of the angelic hierarchy, we find that we are standing at the top: by descending from God to humanity we have also ascended to the heavens, to the very apex of Jacob's Ladder, to the right hand of the Father. "Great is the mystery of godliness", "which things the angels desire to look into..."
I confess to a strong but unconscious shadow of J.R.R. Tolkien's creation myth of the Silmarillion over my whole conception: but then I suspect that Tolkien's myth of the music of Eru Illuvatar drew upon the idea of angels as the Form of creation, created on the First Day before all else was made. This post has become ridiculously long, and I feel a need to write a postscript on fallen angels. There will be a Part Four. Most angelology in the Church has drawn heavily on the writings of the anonymous sixth century (Syrian?) author of the Celestial Hierarchies, known as Dionysius the Areopagite (the Athenian convert of St. Paul), a pen-name giving almost Pauline and Apostolic authority to his work in the early Middle Ages. His three triads of the angelic hierarchy - comprising nine orders altogether - each order passing on transformative knowledge of the divine to the order beneath, are listed below. These orders are derived from the piecing together of various bits of prophetic Scripture and St. Paul: the hermeneutic is of course disputed, but his immense influence on the late Fathers, the Victorines, and the Dominican and Franciscan giants meant that his schema was generally accepted. A few observations: we tend to think of angels (generically) as humanoid in appearance, but in Dionysius' conception of the angelic orders only the lowest two orders appear to us in human form. By the time the Archangel Gabriel reaches the Blessed Virgin at her weaving, the knowledge, love and power that was pronounced in the "Ave" has been translated and transmitted successively through eight orders of angels*. One might note that the orders become (like divine revelation) progressively accommodated to us or "humanised", so that the lowest order of angels present themselves at times in a form that may be mistaken completely by us for regular human contact. There is no such danger of mistaken identity with the seraphim, visions of whom are accompanied by awe and terror (cf. the opening vision of the Prophecy of Isaiah). On top of this bare list of the hierarchical order, Dionysius presents an economy of activity, a mutually interdependent function for each of the nine orders respectively, but also a uniting function for the three orders in each of the three triads. Thus the table can be altered to take account of this: and roughly speaking, the first triad is concerned only with the direct worship of God, and pass on knowledge to the lower orders (one might say incidentally, and as a by-product) because they are kindled with divine fire and wisdom from the light of His face, while the second triad transform this knowledge into ordering, ruling and supervision of the lower orders. The final triad are then sent (they are the order most properly called by the name angel, ἄγγελος or messenger) to communicate the divine word of command - remembering always that telling God's message is the same thing as heralding its enactment, as there is no distinction between the Word and the Act of God in the divine fiat. So with these preliminaries out of the way we can start to fill in some of the Dionysian detail. I have given the names of the hierarchies, "meanings" in inverted commas, and then the conceived functions of each order in the schema below. If one notes carefully, each of the middle orders in the three triads have a mediating function within the triad itself. The knowledge (Cherubim) that is gained through love (Seraphim) is then productive of emulation (Thrones). Courage of purpose (Virtues) translates generous lordship (Dominions) into harmonious rule (Powers). And discernment (Archangels) of the meaning of the divine guidance (Principalities) is necessary for the communication of God's command (Angels). Likewise, there is a mediating role for the lowest member of the First Triad with respect to the highest member of the Second (for the Thrones who bear the image of God's likeness transmit that likeness to the Dominions who then exercise that image in their rule), as also for the lowest member of the Second Triad with respect to the highest member of the Third (the harmony engendered by the Powers allows the Principalities to give rightly ordered guidance to all created things). Along comes Thomas Gallus in the early thirteenth century, originally a canon of the Abbey of St. Victor in Paris, to flesh out Denys in his magnum opus commentary, the Explanatio, and in the Glosses on the Angelic Hierarchy. Thomas's interpretation is largely to present the inner or psychological aspect of the angelic hierarchy, its role within an individual's mental, contemplative, and moral life: the angels are conceived as a path to God with the ultimate consummation, the seraphim, as the spark of divine love communicated to the soul. The rational intellect is left behind or subsumed even before we get to the cherubim in Gallus's scheme: the cherubim, traditionally associated with knowledge of God, are taken by him to be the knowledge of union with God that comes through the death of the intellect, and complete receptivity to Him. What is left for the seraphim, one might ask, if the cherubim have such an exalted role? They are the scorching fire, a spark from God Himself set alight in the soul, not only beyond mental knowledge but also beyond experience, if that makes sense: the seraphic aspect of the soul is conceived not so much as a natural power turned towards God as a divine smiting and kindling of the soul above its proper nature. A caution here: one would make a mistake if one thought that Gallus is taking the angelic orders as "symbols" of a psychological structure. Rather, Gallus conceives of them as living beings who constitute the psychological structure of our soul. An image will help to make this clear, and also to bring in Christology. Jacob's ladder - recall the dream in which Jacob sees angels going up and down a ladder to God the Father - has been understood by tradition to be Christ the Mediator. Upon the ladder of his nature, both God and Man, joining heaven to earth by a stair, the angels go up and down both receiving messages from above and passing them on below. Thus the Incarnate Deity is the home and sphere of action of the angelic hierarchy: and in us who are the co-heirs in Christ is the same celestial dance enacted. Right from the lowest and humblest message from God, given in the simplest way and most accommodated to our senses, right up to the most hidden and searing communication of divine light to the soul at its origin, giving it a divine life beyond its natural power, the messengers of God are playing to and fro in a relay of His loving intent. Thomas Gallus, one can see, follows Dionysius pretty closely, but his angelic functions bring out some latent features in the hierarchy nicely. As one progresses down through the orders there are certain consistent accretions and developments. If one thinks of the angelic hosts as communicators of truth in our soul, for example, the progression in our minds is from the unknowing of love to intellectual and moral truth to the symbols that carry truth - the truth becomes less of an immediate experience in the lower orders, and more of a proposition for mind and will to be conformed to. If one goes back to Dionysius, one can see what Gallus is translating into psychology: the means of communication of truth by each order are progressively more visible and tangible, and by the time one reaches the angels one hears the message in the symbols of human speech from one in human form. This progression of descent through the hierarchical orders - from the unspeakable to the tangible - gives me my approach for the next post on this topic. My follow-up post on this topic will be a bit less serious. I would like to translate the psychological hierarchy of Gallus into a visible one, i.e. into the symbols of the visible creation. Given that the angels' sphere of activity is Christ, the Word made Flesh, and given that Christ is the fulfillment of all creation including the visible things, I would like to try to place each of the angelic activities in relation to the hierarchy of the visible created order. In order for this not be specious, it must simultaneously be (a) psychologically convincing, (b) follow the lines of the tradition I have laid out above, (c) be consonant with the traditional images of the angelic orders (e.g. the Thrones are said to be "full of eyes", so the visible symbol will need to have a point of contact with this image). So I don't hold out much hope for a complete success. If any reader wishes to post their own ideas to help with this, please do. Part 3 is now posted here. When were the angels created? It was a question of some moment for the rabbinic interpreters, and for the Church Fathers - I seem to remember a lengthy disquisition in The City of God on the topic. I had some new light on the question recently in Dr. Barker's Temple Theology (2004). The rabbinic interpreters were very insistent that the angels were not created on the first day, but there is (possibly) good reason to believe that an older tradition held that they were. If each part of the Temple was a pattern of Creation, then the Holy of Holies was the First Day, over which the firmament of the veil was stretched out. Within was the Unity, beyond time and matter, and it was also the abode of the angels - as the ideas or laws or even the elemental forces of creation. The clues are there in the songs and hymns of creation, in the Song of the Three Hebrew Children, and in Psalm 148: the angels are mentioned with the heavens, before all other beings, before even the "waters above the heavens" which were separated from the "waters below" on the Second Day in the creation of the firmament, and before creation of the stars. There is also (and the rabbinic commentators agree on this) an idea of timelessness about the first day. In the particularly pregnant ordering of Genesis 1, the "evening and the morning were the first day". Considering that the light was created on the first day, that means that the primal darkness was God's first work, the hovering Spirit's nest. In that Holy Place the angels were hatched out from God's decree and order and in some sense are the Form of the divine pattern. One is tempted to ask - did Jeremiah meet Plato after all? I have often found a philosophical difficulty with talking about things, even qualities of things. Perhaps this is my own difficulty, and does not really exist. But the problem is this: that things, objects, seem to dissolve before analysis, and are crying out for some idea like Plato's Forms to guarantee their permanence as ideas. The content of the ideas sometimes bears little relation to the phenomena of the things themselves: lions are not especially brave, we are told by the expert observers. Nevertheless, the complex ideas related to these Archetypes have a relentless power and permanence over not just an individual but a collective imagination. Here is a link to Part 2, and also to Part 3.